headaches and allows you to get down to business. 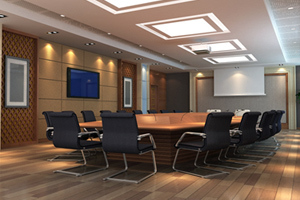 • Select the setup of the room with the touch of a button…conversation, presentation, video conference and more. • As soon as the lights dim, the shades go down to create the perfect atmosphere for your presentation. • Modify the backlighting, select which PC to display on the projector, bring up the volume to the perfect level, all with one touch, reducing calls to your IT department for assistance. • Impress your colleagues, customers and partners with one-touch scenes that dim or raise the lights, and change the background music. • Integrate audio and video-conferencing systems into one easy-to-use experience. • Choose to manage the system from an elegant touch screen or an app on your tablet or smart phone.